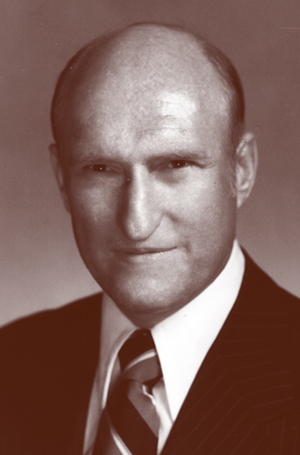 A leading authority in the field of agricultural economics, Charles E. Bishop received a bachelor’s degree at Berea College in 1946, a master’s degree from the University of Kentucky in 1948, and a doctoral degree from the University of Chicago in 1952. Bishop was a faculty member at North Carolina State University for 20 years, serving also as vice president of the University of North Carolina campus for four years. He left in 1970 to become chancellor of the University of Maryland, where he served four years before coming to the University of Arkansas. During his tenure, the building boom that had started under David W. Mullins continued. The Communications Center, now called Kimpel Hall, was finished, and a new Business Building was constructed just south of it. The Billingsley Music Building was added to the Fine Arts Center. The Engineering Extension Center was created and a program in computer science and computer engineering was begun. And a new baseball stadium and a track and field facility were added. Bishop also developed the administration of the University of Arkansas System, creating an administrative cabinet and appointing chancellors at all the campuses beyond Fayetteville. He left the university in 1980 to become president of the University of Houston System. Personal: Bishop was born June 8, 1921, at Campobello, S.C., to Fred and Hattie Bess Wall Bishop. He and his wife, Lee, were married June 1, 2002.